To Cite: Saeidi Pour B, Farajolahi M, Sarmadi M R, Shahsavari H. Modeling of Personalized E-Learning Environment Based on Intelligent Agents, Interdiscip J Virtual Learn Med Sci. 2017 ; 8(3):e10256. doi: 10.5812/ijvlms.10256. Background: The present study aimed at investigating the designing dimensions of personalized e-learning environment scale based on intelligent agents and presentation of an integrated model from 11 intelligent agents. Methods: This study was an applied research with respect to its nature and purpose, and a descriptive and survey research with regards to data collection methodology. The population of the study was 3 main groups: (1) professors in Payame Noor University (15 samples), (2) Ph.D. students in Payame Noor University of Tehran (48 samples), and (3) MA students of E-learning Center in Payame Noor University of Isfahan (112 samples) during the educational year of 2015 and 2016. To collect data, a researcher made questionnaire of personalized e-learning environment scale for intelligent agents was administered. Data were summarized and analyzed using Lisrel 8.5 software and SPSS 16 via descriptive indexes and inferential statistics. Using SPSS, the correlation coefficient between dependent and independent variables were measured, and the path analysis scale was performed to design a casual model, and finally the proposed fitting scale was measured using Lisrel software. Results: Results revealed that among the components of personalized e-learning environment pattern based on intelligent agents, user and electronic content factors were, respectively, the most and least important in the proposed design. Conclusions: The entire path of the research model was significant, which indicated a proper fitness of the proposed model to the real world data. Also, research hypotheses were approved, which means designing personalized e-learning environments by proposed intelligent agents increases the effectiveness of these courses. Many studies have been conducted in the field of benefits of using information and communication technology (ICT) in teaching and learning by researchers in various courses. Learners, who apply ICT in their studies, enjoy open environment in learning. They become responsible for their own learning and are better able to make their own choice in courses and modules (1). Online educational tools should not only present content but also should be capable of interacting with users based on their level of knowledge and methods, and this can be done through intelligent agents. Intelligent agents play an important role in personalization of e-learning environments. In the personalization process, agents provide behavior of the intelligent system, and intelligent agents work together to achieve personalization (2). This research examined the designing dimensions of personalized e-learning environment scale based on intelligent agents and presentation of an integrated model from 11 intelligent agents and communications related to these agents. Personalization ensures that educational system considers weakness and strength points of each individual who participate in educational careers (3). Personalization of curriculum requires different levels of application due to reasons like background knowledge, experiences, motivation, and learners’ different behavioral abilities. Intelligent electronic learning systems are capable of analyzing learners’ behavior to create a proper learning model and provide oriented feedbacks to improve educational environment and adapting it with learners’ desires (4). Personalization has a wide range and includes custom systems, proprietary, and adapted websites. However, personalization is when a user clicks on the web page and only observes the requested content (5). In other hands, research indicates that personalized learning environment has increasingly led to appearance of intelligent agents whose most notable reason is to determine learners’ ability of continuous monitoring and achieving. In addition, agents’ characteristics such as autonomy, involvement, reactivity, and their participation play an effective role in monitoring the learning process and ultimately presenting the content, tests, and personalized recommendations (6). For this reason, constructing the proposed system in the research depends on multiple agents. Intelligent agent is an entity with a level of intelligence and autonomy, which is able to activate and interact with its environment in to access determined purposes (7). More recent studies in the field of e-learning have concentrated on applying multi-agent systems in electronic education environment. In general, intelligent agents are able to monitor behavior, evaluate learner’s performance and importance of the way of transmitting recommendations, and improve quality of learning. Therefore, designing and implementing e-learning environment has increased (8). Finally, this study aimed at investigating a model for designing personalized e-learning environment based on intelligent agents. Thakare et al. conducted a research (intelligent online e-learning systems: a comparative study). They surveyed the various online e- learning designs and then made a comparison among them. Then, they developed an effective online e- learning system requiring 9 fold agents based on the proposed model such as analyst profile agent, resource agent, recommended fuzzy agent, data mining agent, test agent, adaptive queries agent, user interface agent, trainer agent and classification agent (8). Xu et al. in a study applied an intelligent agent-supported personalized virtual learning environment to enhance e-learning effectiveness. According to these researchers, virtual learning environments (VLES) were grounded in constructivist learning theory, and consequently, they improved personalized functions of learning since virtual learning environments are able to meet learner’s various preferences. For this reason, the effectiveness of e-learning will be increased. An empirical field experiment involving 228 university students was conducted. The findings suggested that personalized e-learning facilities enhance online learning effectiveness in examination, satisfaction, and self-efficacy criteria (7). The first layer or the common layer includes 3 basic components, which are the manager, the user, and the instructor in the e-learning environment. The second layer or the user layer includes 5 intelligent agents, which are recording activity, personalization, interaction, the user, and accessibility. The third layer or the middle layer includes 6 intelligent agents, which are educational agent, diagnosis and recommendation of style, planning agent, e- content agent, resources location agent, and posttest agent. The fourth dimension or supporting layer includes instructors’ accessibility and responding, advising and supporting, transparency about the structure of the course and its purposes, and compatibility of supporting and services with learners’ needs and features of the courses. The fifth layer or database includes learner’s profile, teaching-learning theories, personalized recommendations of learning style, e-content, and personalized tests. Accessibility agent: This agent makes possible the feasible accessibility to available resources in the database to satisfy specific needs of the learners and it activates an appropriate learning environment (7). Interactive agent: The interactive agent creates a platform, where goals and contents of learning change for participation of the users. In addition, this agent changes, sets, and manipulates content according to the user’s preferences (3). Personalization agent: Personalization agents of function make possible learning programs, materials, and exams. These agents make an interaction between different learners with the purpose of sending and receiving immediate messages. Moreover, it manages the learning content, the model of learners, the learning program, and the corresponding interaction in system (7). User agent: This agent follows user’s orders, schedules, meetings, screens e-mails, news, and selects good books. The purpose of this agent is to reduce users’ workload through personalizing agents that process personal affairs efficiently (6). E-content agent: This agent receives requests from users, retrieves relevant information from the e- content data source, and provides information for users through the agent source. Planning agent: The intended agent receives questions and results of exams from learning interface and recommends appropriate lessons to learners. Recording activity agent: It records learners’ interactive activities during the learning process and creates user's profile. According to this profile, the agent of modeling reviews the model of learner in a certain time sequence (8). Educational agent: It is a human simulated agent that is activated on the computer of users, and it interacts with learners as they work on web-based educational materials (6). Diagnosis and recommendation of style agent: It offers proper recommendations to the learner, trainer, and the designer of the educational environment via receiving information from the learner’s file and output of the system of the learning style (3). Posttest agent: It estimates the learner’s capability and selects an examination form the database of quizzes, whose difficulty complies with the learner’s capability. Also, the agent records the ability of the learner in exams (7). Resources location agent: It acts as a facilitator and provider that makes possible placement and uses learning resources for learners and educators. The resources location agent includes a wide range of learning materials that support and facilitate active learning (7). General question: What kind of model can be proposed for personalized designing e-learning environment based on intelligent agents? 1. What is the model proposed for personalized e-learning environment based on intelligent agents? 2. Is the proposed model of personalized e-learning environment based on the intelligent agents valid and reliable? 3. What are the elements of personalized e-learning environment based on intelligent agents? This was an applied study with respect to its nature and purpose, and a descriptive and survey research with regards to data collection methodology. The population of the study was 3 main groups: the first group was the professors of higher education in Payame Noor University (15 samples); the second group included Ph.D. students of higher education in Payame Noor University of Tehran (48 samples); and the third group was the MA students of E-learning centers in Payame Noor University of Isfahan (112 samples) during the educational year of 2015 and 2016, which were selected by purposeful random sampling. To collect data, sample size was determined by Cochran formula (calculating the finite population (N = 175)). Then, 190 researcher-made questionnaires on intelligent agents were distributed. To measure reliability, the questionnaire was read and commented by 5 professors of educational sciences group, and necessary editions were done (79% of the variance of research variables was specified). Also, validity of the questionnaire was calculated using Cronbach’s Alpha via SPSS for learners’ satisfaction with 95% confidence interval. The general value of Cronbach’s Alpha is 0.806. Data were collected using intelligent agent questionnaires that were answered by respondents in e-learning environment. The questionnaires were designed according to 5-point Likert scale, which consists of 52 questions and 11 dimensions based on the 11 desired factors. In a 5-part spectrum, the answer was exactly in favor of the score of 1 and was given a completely opposing answer to Grade 5. Data were summarized and analyzed using Lisrel 8.5 software and SPSS 16 via descriptive indexes and inferential statistics. First of all, data were described using descriptive statistics indexes. Then, to design a casual fitting model, the proposed fitting scale was measured using Lisrel software. Research variables were applied in all agents. Using SPSS, the correlation coefficient between dependent and independent variables were measured, and finally path analysis scale was performed to determine the casual relationship between the research hypotheses. Path analysis method used in this research was generalized from regular regression, which is able to identify direct and indirect effects as well as total effect of each independent variable to the dependent variables and reasonably explains the observed relationship and correlation between the variables. Inclusion criteria included taking part in the study, and at least 1 year of participation in E-learning courses. Sampling was continued according to criteria of entering into study gradually until data saturation. With respect to ethical considerations, it was attempted to preserve the confidentiality of the data; moreover, research purposes were described to participants prior to the study and data collection. From among 175 individuals, 62 were male and 113 female, 111 had a BA degree (MA student), 49 had an MA (Ph.D. student), and 15 held a PhD degree. Also, 42 individuals were instructors, 11 assistant professors, 1 associate professor, and 2 professors; moreover, 7 had MA and 111 had BA (MA student) degrees, 87 studied educational sciences, 45 IT engineering, 22 psychology, and 21 studied other fields. In order for research data to be of value and use, it must be examined for reliability and validity to demonstrate the rigor and trustworthiness of research. Reliability of the questionnaire was measured using statistical procedures such as Cronbach’s alpha coefficient and the results obtained revealed that the questionnaire was reliable and accurate. There are several ways to demonstrate validity, one of which is confirmatory factor analysis test since the variables of the research were multi- component. Applying factor analysis requires identifying whether the factor analysis finds the factors that best fit the available data or not, that is, to find whether the number of data is enough for each factor? For this, the Kaiser- Meyer- Olkin (KMO) and the Bartlett test were used. The Kaiser- Meyer- Olkin (KMO) measure should be greater than (0.6) and close to 1. The Bartlett test should be significant (ie, a significance value of less than 0.05); the outputs of the 2 tests are represented in Table 1. According to the results in Table 1, the rate of KMO index was 0.910 (more than 0.6); therefore, the number of samples (respondents) for factorial analysis was sufficient. Also, the sig level of Bartlet test was less than 0.05, showing an appropriateness of factorial analysis for introducing the structure of factorial model, and thus the assumption for introducing correlation matrix was rejected. Since the result of KMO and Bartlet tests represent the appropriateness of data achieved from the questionnaire for factorial analysis, it is possible to apply the exploratory analysis on the research questionnaire. 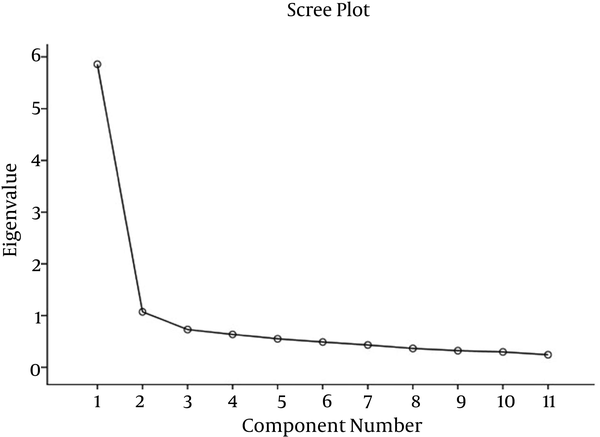 The following diagram is a Scree plot that shows 2 items are known with values more than 1 in their specific value. The following figure demonstrates changes in relation to their factors. This diagram is used for specifying the optimal number of items. The diagram shows that changes in the specific value decreases from the second factor onward, therefore, it is possible to name these 2 factors as influential factors with the most important role in determining variation in data. In exploratory factorial analysis, the method of principle components was used to elicit the factors and Varimax rotation and Kaiser Normalization was used for rotating factors. Decision- making criteria for survival or deleting the questionnaire items using factorial analysis was the shared values of their elicited amounts, so that if the value of eliciting value for each question was less than 0.5, that question would have been set aside from factorial analysis. Also, the decision- making criteria for classification questions were the specific values more than 1 and factorial scores more than 0.4. Results of exploratory analysis are presented in Table 2. According to Table 2, the value of the elicited shared value for the entire questions was more than 0.5, and none of the questions needed to be removed. The criteria for selecting each scale in its specific category was the value of factorial load as observed in Table 2, and the value of factorial load for the 5 components of the user factor, activity recording factor, personalized factor, interaction factor and Accessibility factor was greater than 0.4 and had a higher coefficient than the second category. Therefore, these components belong to the first class components and the second class component in accordance with the factorial load components including educational factor, diagnosis and recommendation factor of style, planning factor, electronic content factor, replacement resources factor and posttest factor. Also, according to tables, the factor or the first component is a user that specifies 53.25% of the changes in the main variable and then the middle variable that specifies 9.74% of the changes in the main variable related to this factor. Partial least square software is designed to estimate and test structural equation models. The intended software using correlation coefficient and covariance between the measured variables, estimate factor loadings, variances, and errors of latent variables, and it is used for implementing exploratory factor analysis, confirmatory factor analysis, second-order factor analysis, and path analysis (causal modeling with latent variables). The most important reason for using this method is abnormal data or small sample size. There are 2 main steps for analyzing models using interpretive structural modeling with partial least square approach that includes model fitting and hypothesis testing. Factor loadings were calculated by correlation indexes values (questions) of a structure with another one. To examine the structural model, several criteria should be fitted, the first of which is used to measure structures relations in the criteria model of significant numbers of t or the same t-values. Such numbers should be greater than 1.96 to confirm the relationship between structures and research hypotheses with 95% confidence interval. However, t numbers just show the correctness of relations and cannot measure the intensity of structures. The results of path coefficient are presented in Figure 3. As a result (communalities) is equal to 0.37. According to the values of R2 in Table 3, R2 is equal to 1.00. According to the 3 values of 0.01, 0.25, and 0.36 for weak, average, and strong values for GOF, the result of 0.61 represents high fitting of the model. Grading of variables using Freedman test to analyze the importance and grading of the influence of the e-learning environment patterns were personalized based on smart agents using Freedman test; the results are reported in Tables 4 and 5.
aNumber, 175; K-Squire, 41.720; Degree of freedom, 10; Significance, 0.001. Results revealed that among the components of personalized electronic learning environment pattern based on intelligent agents, components user, accessibility, planning, activity recording, personalized, replacement resources, interaction, educational, post-test, diagnosis and recommendation style and electronic content factors were, respectively, the most and least important among intelligent agents in the proposed design. The present study aimed at investigating the designing dimensions of personalized e-learning environment scale based on intelligent agents. Findings of this study revealed that overall paths in the research were significant and that the research hypotheses were approved, which indicates a proper fitness of the proposed model from real world data. Designing dimensions of personalized e-learning environment scale by applying intelligent agents and presenting an integrated model from 11 intelligent agents contributed to the effectiveness of the courses. Based on the purpose of this research, one of the considerable issues in educational systems and specially e-learning environments is recognizing learner’s needs and designing the curriculum based on users’ abilities. Moreover, offering proper recommendations, continuous monitoring and attention to feedback from learners in a learning process facilitate targets of this system (5). Personalization of curriculum demands on different levels due to reasons like background knowledge, experiences, motivation, and learners’ different behavioral capabilities. Intelligent electronic learning systems are capable of analyzing learners’ behavior to create proper model learning and orderly provide oriented feedbacks to improve educational environment and adjust it with learners’ desires (4). On the other hand, research indicates that personalized learning environment has increasingly led to intelligent agents, and the most notable reason of which is learners’ ability of continuous monitoring and achieving and this facilitates the technology of agents and interaction between learners and educational systems that results in personalization. In addition, agents’ characteristics such as autonomy, activism, reactivity, and their participation together with monitoring learning process, and ultimately presenting content, tests, and personalized recommendations play an effective role (6). For this reason, architecture of the proposed system in the research is on basis of multiple agents. In fact, intelligent agents are a modern technology and innovative concept. Intelligent agents are used to conduct repeated and expected missions in electronic education systems. Features of intelligent agents include learner autonomy, social ability, adaptability, and responsiveness. Therefore, this application can give rise to proper activity and response to provide e-learning environment without participation of users (7). More recent studies in the field of e-learning have concentrated in applying multi- agent systems in electronic education environment. In general, intelligent agents are able to monitor behavior, evaluate learner’s performance and importance of the way of transmitting recommendations, and improve quality of learning. Thus, implementing e-learning environment has increased (8). Results of Freedman test revealed that among the components of personalized electronic learning environment pattern based on intelligent agents, components user, accessibility, planning, activity recording, personalized, replacement resources, interaction, educational, posttest, diagnosis, and recommendation style and electronic content factors are, respectively, the most and least important among intelligent agents in the proposed design. Nowadays, online educational tools should not only present content but also should be capable of interacting with users based on their level of knowledge and methods, which are done through intelligent agents. Intelligent electronic learning systems are capable of analyzing learners’ behavior to create a proper model of learning and orderly provide oriented feedbacks for improving educational environment and adapting it with learners’ desires (4). 1. Organizations should be monitored to ensure the quality of courses and e-learning institutions in particular and encourage them to use experts who are active in this field. 2. Changing from paper and procedures to executive dimension of e-learning at all steps and training skilled specialists with their own style. 3. Emphasizing multiple interactive e-learning and supporting courses comprehensively. 4. Considering individuals’ differences and learners’ various needs and diversity of techniques, tools and e-learning- based environment.